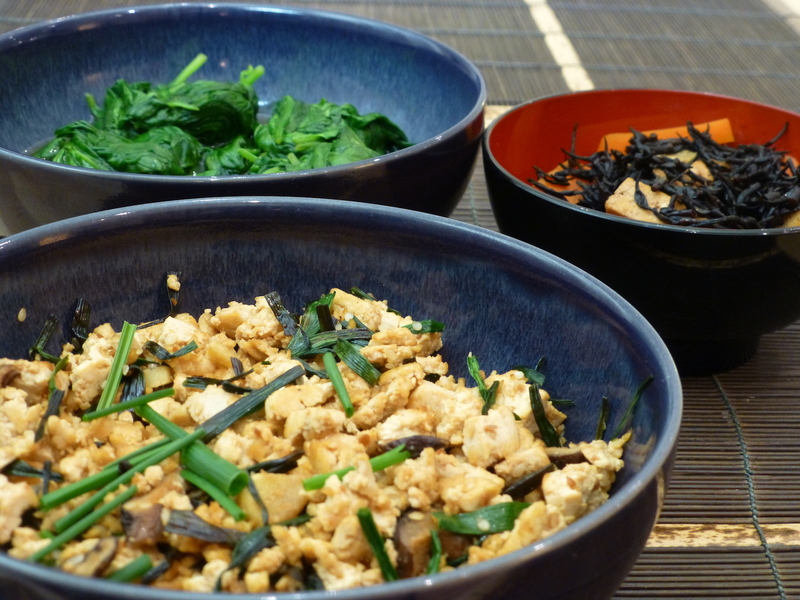 Scrambled tofu, hijiki, spinach and rice • Quick & Tasty - Get Cooking! This is a rather elaborate Japanese meal with three dishes and rice. Each of the dishes does not take long to prepare (15-20 minutes) but requires some soaking time. Two of the dishes use kombu dashi, this is very easy to make but requires some forward planning: put a piece of kombu of about 10 x 10 cm into about 500 ml water and put it in the fridge overnight. I have written out the recipese for each dish separately, in the order in which I prepared them. The hijiki and shiitake need to be soaked for one hour, and the rice needs an hour in total before cooking as well. After this hour soaking time you can just prepare them in order, or if you want it to be a little bit quicker, you can start the rice and the iridofu when you’ve set the hijiki to simmer. This is another very typical Japanese dish called hourenso no ohitashi (ほうれん草のお浸し), you can find the original recipe at Just One Cookbook and a very quick and easy variant at Just Bento. It is and very easy to make if you have the dashi ready. The preparation time is about 5 minutes but it has to marinate for at least 30 minutes after that so it is not actually quick. Mix the dashi, mirin and soy sauce. Put the spinach in the microwave for 1 minute or at most 90 seconds, so that it is just fully wilted. Rinse under cold water to cool. Then squeeze the juice out of the spinach with your hands and create “logs” of about 10 cm long and 3-4 cm wide. Cut the “logs” into pieces of 2-3 cm and put them in a shallow bowl. Pour over the dashi mixture and let marinate for at least half an hour. By the time the other dishes are prepared it will be ready to eat. This way to prepare hijiki seaweed is a very common in Japan, and you can find the original recipe for example at Just Bento or at Just One Cookbook. My variation is to add some ginger and use vegan kombudashi rather than the katsuodashi common in Japan. Soak the hijiki for at least an hour in cold water. Cut the tofu into thin strips and put it in the microwave for 2 minutes at full power (900W). Heat the olive oil and sesame oil. Fry the tofu, carrots and ginger until the tofu just starts to brown. Add the soaked hijiki and fry some more. Add the dashi and kaeshi and simmer over low heat for 20-30 minutes until the carrots are tender. While it’s simmering, you cand start cooking the rice and the iridofu. The final and most substantial dish in this meal is iridoufu (炒り豆腐), another very common dish. It is quite easy and quick to make, in about 15 minutes. The original recipe is from Just Bento. 4 dried shiitake mushrooms, soaked in hot water for at least an hour. You will need 4 tablespoons of the soaking liquid as well. Heat the oil and fry the ginger and the sesame seeds, then add the chives and mushrooms and fry over medium heat for 30 seconds. Meanwhile, mix 4 tablespoons of the shiitake soaking liquid with the miso and the soy sauce (optional as it mainly makes the dish a bit more salty). Add the mixture to the pan and fry over medium heat until the liquid has completely gone. The dishes are complemented with plain Japanese rice. Use 1.1 cup water for 1 cup rice. The cup I use is 200 ml. Cook at reduced power (40%, 360W) for 15 minutes.